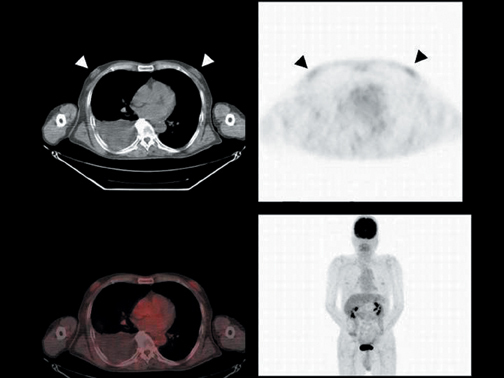 left), while increased FDG uptake in the bilateral anterior chest was observed on FDG-PET (SUVmax = 2.3, Figure 1, upper right), and the anatomical localization of FDG uptake in the mammary tissue was confirmed by co-registration of the FDG-PET and CT images (Figure 1, lower left). Gynecomastia is observed as a proliferation of breast tissue on CT and as dense breast tissue on mammography. The relationship between breast density and FDG uptake was reported by Vranjesevic, et al.8 FDG uptake in dense breast tissue was significantly higher than that in fatty breast tissue. Uno, et al., compared FDG uptake and ultrasonographic findings in fibrocystic mastopathy patients,1 FDG uptake in mammary tissue correlated with severity of mastopathy. These reports suggest that proliferation of breast tissue causes the increase of FDG uptake. FDG-PET/CT can provide morphological and functional information simultaneously and assess the status of mammary tissue through co-registration of both images. We reported a case of spironolactone-induced gynecomastia revealed by FDG-PET/CT. In male patients, history of medication and illness should be taken into account when FDG uptake in bilateral mammary tissue is observed. Uno K, Yoshikawa K, Imazaki K, et al. FDG-PET evaluation of fibrocystic mastopathy in patient with breast tumor. Eur J Nucl Med. 1994;21:S197. Nuttall FQ. Gynecomastia as a physical finding in normal men. J Clin Endocrinol Metab. 1979;48:338-340. Glass AR. Gynaecomastia. Endocrinol Metab Clin North Am. 1994;23:825-837. Braunstein GD. Gynecomastia. N Engl J Med. 1993;328:490-495. Mathur R, Braunstein GD. Gynecomastia: Pathomechanisms and treatment strategies. Horm Res. 1997;48:95-102. Rose LI, Underwood RH, Newmark SR, et al. Pathophysiology of spironolactone-induced gynecomastia. Ann Int Med. 1977;87:398-403. Fukuchi K, Sasaki H, Yokoya T, et al. Ga-67 citrate and F-18 FDG uptake in spironolactone-induced gynecomastia. Clin Nucl Med. 2005;30:105-106. Vranjesevic D, Schiepers C, Silverman DH, et al. Relationship between 18F-FDG uptake and breast density in women with normal breast tissue. J Nucl Med. 2003;44:12381242.